When you want to protect your home from water damage, adding new seamless gutters from Huff ‘N Puff is a good way to start. Unlike traditional gutters that can develop gaps between sections as they age, our gutters are formed on site from a single piece of metal to ensure a reliable water flow across the entire length of your roofline. 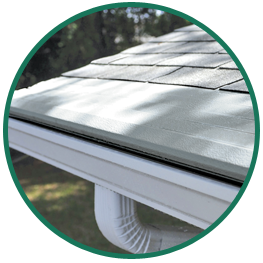 To further ensure proper drainage, our seamless gutters are made from the heaviest gauge aluminum available so that they can withstand years of exposure to the elements without any deformation. Huff ‘N Puff also performs an exclusive 5 Star installation to ensure your complete satisfaction. Our process begins with our team thoroughly explaining the installation process for your seamless gutters. We’ll also always be available to answer questions you may have throughout the duration of the project. Huff ‘N Puff also commits to a strict schedule as part of Perfect 10. The final step is our unique 22-point Zero Defect inspection, which confirms that your job was completed to the highest quality standards. This incredible commitment to customer satisfaction has helped our company earn an outstanding A+ rating from the Better Business Bureau, while completing projects for more than 35,000 homeowners throughout the Hudson Valley and Capital Region. To find out more about our seamless gutters and gutter guards for the Hudson Valley and Capital Region, call us at (855) 483-3678 today.